There are times when kids are simply clumsy, uncoordinated, or accident prone. We joke about kids having two left feet or having string bean legs that get out of control. This is a natural part of growing up. But, there are times when motor deficiencies are pointing to more than just natural childhood development. Motor dyspraxia falls under the umbrella of sensory processing disorder as a condition in which the individual struggles to translate sensory information into thought out physical movement. You may have heard the term “Developmental Coordination Disorder.” The jury is still out on whether it can be used interchangeably with motor dyspraxia, which can make it really confusing to try to differentiate the two (if there is a difference at all! ), so don’t stress if you see one word or the other. While a child may know that he needs to put on his shoes and has done so many times, each step of the process takes a lot of effort and thought. With practice, this child will get better at putting on his shoes, but it will always take more effort for him than his peers without dyspraxia. In many ways, dyspraxia can feel like having a disconnect between the body and the brain. It’s similar to pushing the gas pedal on a car and realizing that the gear shift is still in park. Despite all of our good intentions and willful thoughts, we can’t get the car to function if we can’t understand how to take the car’s gearshift out of park and into drive. Children with dyspraxia consciously understand what physical movements they want to do, but it’s challenging for them to figure out how to do them. How do you go from a bare foot to a foot with a sock and shoe nicely laced up around it? How many steps is that? What comes first? How do you get the body to do those things? How do you put the car in drive instead of park? Novel and new activities pose a particularly difficult challenge for children with dyspraxia. While a child may learn how to effectively learn to put on a t-shirt with practice and methods such as forward and backward chaining, when presented with a button-down sweater, they don’t understand how to even get started. The steps of this new activity aren’t clear and need to be carefully practiced prior to independence and mastery can be acquired. Is Motor Dyspraxia a Sensory Issue? You may be wondering how dyspraxia is a sensory issue. Well, if you Google dyspraxia, you will find many websites and articles that neglect the sensory system when discussing dyspraxia. This is not to say that the info they present is wrong but, in my opinion, these websites and articles leave out an important piece of the puzzle. When we set out to do an activity—put on a shirt for example—we take in a wide variety of sensory information. We feel the shirt, see the shirt, and understand where the shirt is in space in relation to our bodies. As we go through the process of putting on the shirt, our brains are constantly taking in this sensory information in order to complete the task successfully. Reaching for the shirt, grasping the shirt, bringing the shirt to our bodies, locating the arm holes, etc. For most of us, all of the steps required to put on a shirt happen instantly and subconsciously. Our brains are constantly processing and translating incoming sensory information so that we can put on our shirts in only a matter of seconds. This happens so quickly that we don’t have to think too hard about putting each arm through the sleeves. Actually, we don’t usually have to think about it at all. We can put on a shirt while thinking about our dinner plans or a movie we just watched. We’re easily able to take in sensory information and properly integrate it in order to complete a task. Now imagine that with each body movement we needed to focus very hard on what was coming next. The sensory information coming in about where the shirt is in space isn’t making sense and it takes us multiples tries to thread our arms through the sleeves. When we finally get our arms through the sleeves, we can’t find the opening of the shirt and our head gets tangled in the cloth. This is not general clumsiness. No, this is an inability of our brain to take the incoming information about where our body is in space and translate it into the actions needed to put on the shirt. It’s sensory based. Now that we’ve talked about what motor dyspraxia is, let’s talk about strategies for managing it. Life with motor dyspraxia can be really frustrating! When your body doesn’t do what your brain wants it to, it can be really demoralizing. Kids can really struggle to be motivated to do physical activities, as it can be so much more mentally and physically draining than it is for other kids. There are ways to help though! A child with dyspraxia has trouble understanding how to go from A to Z so, let’s only require them to go from A to B. As your child ages, you will be able to introduce more complex tasks with a higher degree of success, but focus on simplicity for now. Try to think of ways to eliminate steps wherever possible. Taking the cap off of the toothpaste, laying out a shirt the night before, loosening the seal on hard to open granola bars or bags of snacks before putting them in your child’s lunch box, buying shoes with stretchy laces instead of string laces that need to be tied, etc. By focusing on simplicity, you will increase your child’s chances for success and independence. In addition, by giving your child more opportunities for success, you will also build their self-confidence. Dyspraxia can be exhausting for a child and it’s easy to get discouraged. Having trouble with tasks that your child sees their peers completing with ease is hard. Increase your child’s motivation and decrease frustration by making tasks simpler. 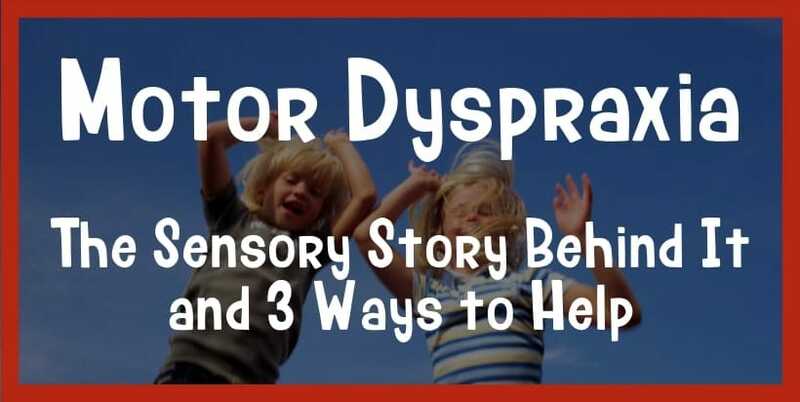 As the brains of children with dyspraxia aren’t able to appropriately integrate sensory information and translate it into movement, we need to help them use their non-sensory resources and manipulate the situation to set them up for success. This is a challenge given that we live in a sensory world, but it is possible to at least limit reliance on sensory information. When expecting your child to perform a task, try to keep the environment, circumstances, and task elements consistent. For example, always lay your child’s shirt out in the same place, in the same direction, with the front always facing down. While it will still take a lot of practice, overtime, these predictable conditions will help them learn the motor movements required to don a shirt that’s laying front side down. If, conversely, you lay out the shirt in a different position every day, your child will constantly have to “rewire” their motor pattern, which increases their challenges and inefficiencies in donning the shirt. Don’t worry that your focus on consistency is going to limit your child’s exposure to novel experiences. The world is an unpredictable and crazy place and nothing is ever the same today as it is tomorrow. Even the most careful planning and organization wouldn’t prevent your child from having a countless number of novel sensory experiences every day. Give your child a break from tackling new physical tasks as often as possible by controlling everything you can. While you may not have much influence over what happens outside of your home, you can create consistency in your child’s morning and evening routines that will offer your child a bit of relief from the struggles their dyspraxia brings them. If dyspraxia is about the body’s inability to properly integrate sensory information and translate it into movement, let’s help the body understand the sensory information it’s receiving a little bit better. Imagine the difference between laying on the couch and pushing a heavy box across the floor. In the first circumstance, your brain and body get to relax and check out. In the second circumstance though, your brain is being flooded with input from your arms, legs, and core. As you strain against the heavy box, your joints compress, your muscles contract, and your brain gets a huge dose of sensory information that it needs to process. Basically, it gets to practice sensory integration. When we encourage children with dyspraxia to do heavy work, we help strengthen their mind-body connections and hone their motor skills. By telling the brain to pay attention to what the body is doing, the child gets a better sense of how their body moves in space and what movements are required to complete certain tasks. 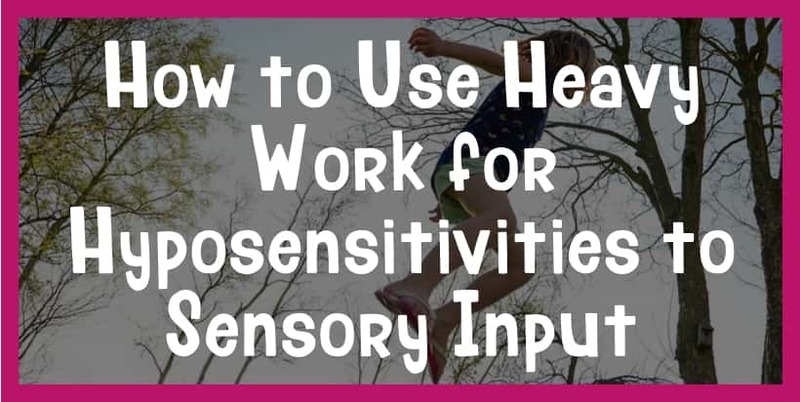 Check out another great post from The Sensory Toolbox! It’s important to be aware that your child may not be a fan of doing heavy work. Given that heavy work is very physical in nature, it’s going to be challenging. For a child with dyspraxia, laying on the couch takes a lot less physical and mental effort than pushing a heavy box across the room. They also aren’t going to be very good at it right away, which means they’ll need extra motivation to participate. Be creative in how you introduce heavy work to your child and try to make it fun. Let your child push the cart at the grocery store, do jumping jacks while waiting at the dentist’s office, or help stir the cookie dough batter. Think of what your child enjoys doing and think of ways of making it more physically demanding. Motor dyspraxia is a condition that can be challenging for both the child and parent. While it isn’t something that has a quick fix solution, it is something that can be better managed through experimentation and continued learning about your child’s strengths and deficits. 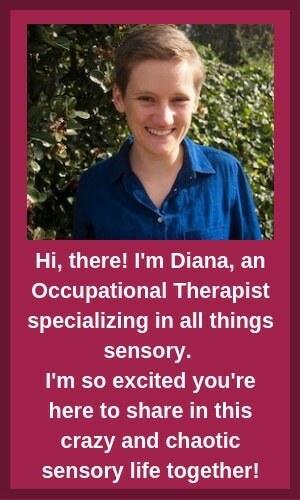 Work with your child’s occupational therapist to best understand the strategies and techniques that will maximize your child’s success.